During the early development stages of the new 9-3 Sport Sedan, Saab's chief chassis engineer, Ekkehard Schwartz, was asked to describe the car's core appeal. His immediate response was a quick sketch, but not of the car itself. 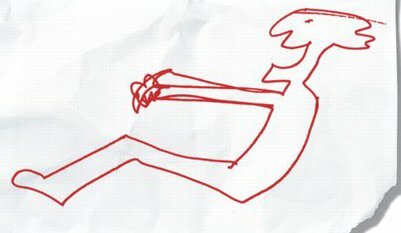 He drew the image of an exhilarated driver. Norcross, GA - The whole idea, Schwartz explained, was to build the car around the driver, focusing on achieving a rewarding, interactive experience behind the wheel. Every element of the design of the new Saab 9-3, therefore, aims to enhance communication to and from the car, involving rather than insulating the driver. That includes the design of the chassis, the powertrain, the steering, all controls and the immediate driver's environment, the cockpit of the car. The key element of the sketch is the big grin to the driver's face, Schwartz emphasized. The pure joy of driving is, ultimately, what it's all about. Schwartz' original sketch has now been adopted as the central image in an international marketing campaign to announce the arrival of Saab's first compact sports sedan. "My artistic abilities may be rather limited, but it is clearly the message that counts," he noted. "Although I think I'll stick to my career in chassis development work."